Now that the flagships from Samsung and HTC have been on the market for a little while, LG is here to shake things up with their newest flagship device: the LG G4. 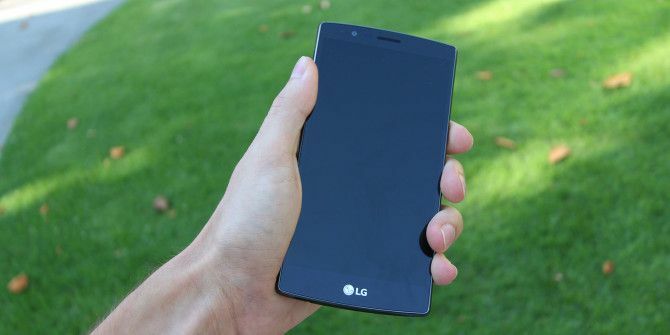 The successor to the LG G3 (which we loved LG G3 Review and Giveaway LG G3 Review and Giveaway Read More ), the G4 refines what was great about the G3, and it manages to stand out in a crowded market thanks to a great camera, removable battery, gorgeous screen, and optional genuine leather back cover. Read on to see how you could win the LG G4 for yourself. The LG G4 is a gorgeous phone that feels great in the hand, but it couldn’t be further from the slim, metal Galaxy S6 Edge (our review Samsung Galaxy S6 Edge and Gear VR Review and Giveaway Samsung Galaxy S6 Edge and Gear VR Review and Giveaway Samsung sells more Android devices than any other manufacturer, and thanks to some aggressive marketing, the Galaxy brand is almost synonymous with Android. Read More ). With a 5.5″ screen, it’s also a good deal larger than other flagship phones, like the 5″ HTC One M9 (our review HTC One M9 Review and Giveaway HTC One M9 Review and Giveaway Metal design? Check. Expandable storage? Check. All the most powerful internals? Check. On paper, the HTC One M9 is one beast of a phone. Read More ); in fact, physically, it has the most in common with the much cheaper Asus ZenFone 2 (our review ASUS ZenFone 2 Review and Giveaway ASUS ZenFone 2 Review and Giveaway As more people are fed up with smartphones that cost well over $600, some manufacturers are taking notice. ASUS brings us the ZenFone 2, a $299 phone with internal specs that easily trump its competitors. Read More ), which itself looks a lot like an LG G3 copy. The curved back panel gets pretty thick at the center — 9.8mm to be exact — but it tapers around the edges, which makes for a comfortable grip. The phone comes in both genuine leather and plastic back cover versions, though we reviewed one with black leather. It makes for a fingerprint-free device that’s also comfortable and warm to hold. It’s also vertically curved in a similar vein to the LG G Flex2, though to a much lesser extent. In fact, you probably won’t even notice that it’s curved unless you place it on a flat surface and look at it from the side to see how there’s an empty space between the center of the screen and the surface. The sides of the device still feel very plastic, though you won’t find any buttons on them. All of LG’s buttons are on the back of the device once again, which really is a love-it or hate-it design. I acclimated to it quickly (the knock-on and knock-off features make that easier, which we’ll discuss later), but others find it less intuitive than side buttons. The buttons do have a new texture that makes them easier to feel around for on the back of the device — the volume keys are rougher than the raised power button in the center. They rest just below the camera in the center of the device, which makes for a nice symmetrical look and also happens to be right where my pointer finger falls when holding the phone. The back is also home to the 16MP camera, dual-LED flash, and infrared sensor for the camera’s laser-based autofocus. On top of the device, you’ll find an IR blaster (more on that later), and towards the bottom of the back is the speaker grille. Overall, I think the design of the G4 manages to look nice and premium while still feeling comfortable in the hand, though it’s easy to see how some might dislike the genuine leather back, the thickness of the device, or the rear position of the power and volume buttons. Despite the fact that the G4 has kept the same resolution and screen size as the G3, this is definitely not the same screen. LG has focused on refining the screen to make it more colorful, have better contrast, and be brighter. They’re calling this a “Quantum” display. Fancy marketing term aside, it really is a gorgeous screen. I was surprised by how easy it was to use outside in direct sunlight. With the One M9 and S6 Edge, visibility in direct sunlight was alright, but not great — the G4 has really managed to check that “great” box. You could certainly argue that the 2560 x 1440px Quad HD display is overkill (in fact, Quad HD is one of those annoying marketing terms How Advertisers Trick You into Buying Their Smartphones How Advertisers Trick You into Buying Their Smartphones You hear something about an octa core, 20-megapixel, Quad HD smartphone with 3GB of RAM. You have no idea what that means, but it sure sounds fast and powerful in the commercial. Read More ), and it might be, but that doesn’t negate the fact that it is a gorgeous, detailed, and colorful display. The speaker on the G4 is located in the lower corner of the backside, which is a disadvantage compared to the HTC One M9’s front-facing speakers, but it is a very loud speaker — definitely louder than the One M9. Audio quality is on par for a smartphone, meaning it won’t be the best for you audiophiles out there, but the important thing is that it gets loud. If you’re watching a video, you might have to cup your hand around the back side to direct the audio towards you, but that’s a minor annoyance. This is probably the area where the LG G4 shines the brightest. That 16MP rear-facing camera — with it’s f/1.8 aperture, 1/26″ sensor size, optic image stabilization (OIS), laser autofocus, and ability to shoot in RAW — is a stunning camera. It can even capture 4K UHD resolution video. The camera has three available shooting modes: Simple, Auto, and Manual. Above, you can see the Manual view that allows you to adjust the ISO, white balance, shutter speed, and more. Plus, for all the photographers out there, you can shoot in RAW Budding Photographer? Here's Why You Should Be Shooting Raw Budding Photographer? Here's Why You Should Be Shooting Raw Every dSLR, prosumer and even some high-end compact cameras have the ability to save raw image files. This isn't just a higher quality of image, it's a gift from the photography gods. Read More here. The above photo was taken with the automatic settings on an extremely overcast day in the late afternoon. It’s a bit grey of course, given how grey it was outside, but nothing that couldn’t be fixed with a bit of photo editing. Shooting in RAW and importing that to Photoshop or Lightroom would allow for even better results. This photo was also taken on the same day with automatic settings. I think it’s clear that the G4 captures a great amount of detail in its photos, and it’s nice to have the option to switch to manual shooting for that much more control. The front-facing camera is no slouch either. With an 8MP camera on the front, the G4 easily has the best front-facing camera on the market, beating out the 5MP options on the S6 and One M9 easily. It’s not just the megapixel count, though; the G4 has a selfie light feature, Gesture Shutter for hands-free selfies, and the option to automatically review photos when you pull the phone towards you. Though this phone does run Android 5.1 Lollipop, the newest version of Android out there, it is overlaid with LG’s Android skin Android Skins Explained: How Do Hardware Makers Change Stock Android? Android Skins Explained: How Do Hardware Makers Change Stock Android? Hardware makers like to take Android and morph it into something that is entirely their own, but is this a good or a bad thing? Take a look and compare these different Android skins. Read More : UX 4.0. Thankfully, LG has followed in the footsteps of Samsung and HTC and managed to simultaneously debloat their Android skin while also adding a few useful features. The home screen and app drawer look pretty basic, though you can tell the built-in LG apps have a very plain, colorful, square look to them. Navigation around the home screen is snappy and quick, and it’s also where you will find Smart Notice — LG’s little assistant for telling you about the weather, warning you which apps are draining your battery, and offering other helpful suggestions. Smart Notice is a nice little feature that’s sure to help out newer smartphone users and make life easier for more experienced users. The plain language weather notices are a nice touch, and if it notices that you always open a certain app after plugging in your headphones, it’ll offer to always open that app when you plug in headphones. It makes the phone feel just that much smarter. Swiping all the way to the left will bring you to the Smart Bulletin. Apparently, some kind of scrollable list to the far left side of the home screen is the cool thing to do now, given HTC’s BlinkFeed and Samsung’s Flipboard integration. LG’s is a bit different, though, because it doesn’t show you news or activity from your social networks. Instead, it’s centered around your LG apps like Calendar, Music, LG Health, QuickRemote. If you actually use the LG apps, that could be very useful. If not, you might want to switch to an alternative launcher Which Android Launcher Should You Use? We Compare the Best! Which Android Launcher Should You Use? We Compare the Best! These awesome launchers will have your Android device feeling brand new. Read More . The notification panel is home to a brightness slider, volume slider, and quick settings. Whereas stock Android 5.1 requires one pull down to access notifications and a second to access the quick settings panel, LG’s software brings it all down on your first pull. For those of us who prefer a less cluttered notification panel, that could be annoying. Many people have also remarked that stock Android 5.0 and 5.1 Lollipop have the problem of getting rid of “true silent mode,” meaning that once you turn the volume all the way down, the phone only goes into vibrate mode unless you also turn it to “Priority Only” or “No Interruptions” mode. This is a pain because the “No Interruptions” mode doesn’t even allow for alarms, so if you hope it use it as a silent mode, you won’t be getting up on time for work. Nobody’s quite sure why Google made the process of silencing your phone that much more complicated, but both Samsung and HTC have taken steps to remedy that in their Android skins — LG, however, has not. They have made it so that in “No Interruptions” mode, the LED will still flash for notifications, which I appreciate, but that’s not truly a “No Interruptions” mode, is it? The most useful feature baked into the G4, however, is the Dual Window mode. Just tap on the square Recents button in the navigation bar and select Dual Window. You can then select two apps to run on the screen at the same time. Unfortunately, the apps you can use seem limited to a selection of LG and Google apps. Additionally, there’s a QuickRemote app for controlling your TV using the built-in infrared sensor. I had no problems with this in my testing, and I actually found it easier and quicker to use than the Peel Smart Remote app that comes bundled with the One M9 and Galaxy S6. Another nice addition is a feature called Glance View that allows you to peek at the time and notifications on your device simply by putting your finger on the screen and pulling down. It’s not perfect, and it has a bit of a delay, but it’s a nice alternative to completely turning on the device every time you want to check it, since Glance View only uses a small portion of the top part of the screen. And if you don’t want to reach to the back of the device to turn off or on the screen, LG has you covered. You can double tap on the screen to wake it up, or, if you prefer a bit more security, you can set a knock code so that you have to tap on the screen in a certain pattern to wake it up. Think of it as an invisible PIN code that doesn’t require the screen to be on. And when the screen is on, you can turn it off by double tapping the status bar at any time. Unfortunately, despite all the other great aspects of this device, battery life was the most disappointing. The good news is that the 3,000mAh battery is removable, so you could just swap it out for an extra battery halfway through your day, but that’s a poor alternative to good battery life. On most days, with really only light to moderate usage, the G4 barely made it through my relatively short day. If I started my day early, it was usually dead before night rolled around. Heavy usage would kill it in the afternoon on most days. The hour and a half of screen on time shown above wasn’t unusual. Battery life was a bit random, honestly. One day I got almost four hours of screen on time (see below), but most of the time, I was safely in the one and a half to two hours range — and that’s with almost identical usage every day. I had high hopes for this large battery, but it simply failed to perform. Even the Galaxy S6 consistently got over 3 hours of screen on time for me, and I wasn’t very impressed with it’s battery life compared to the One M9 (though the M9 had no tool for measuring screen on time). If you do get the G4, you might want to take advantage of that removable battery and buy a spare. Charging speed wasn’t bad, but it wasn’t nearly as fast as the Galaxy S6’s quick charging capabilities — and it did get extremely hot while charging anyway. Should You Buy the G4? LG is doing a really good job of challenging Samsung and HTC here. Both the cameras on the G4 take stunning photos, the physical design is sleek and comfortable to hold, and the software adjustments are minimal. The biggest problem is the awful battery life, even if that could be supplanted by the fact that it’s the only flagship with a removable battery. So who is the lucky one? Good reviews. I am back in the analog dark ages, Time for the newest, biggest and baddest phone! Great to read such an in depth review. Would love a new phone, mine has had it! Really useful review having in-depth info, hope would soon be available here in Pakistan! Good review...and nice price too, hope I can have one.. Hoping to win... my daughter passed away in March and I haven't smiled since.Love you guys at MUO... thanks for the chance to win! I hope i win but congrats to whoever wins if i dont. That would be nice to win such a device.
. Wow, prize LG is fab. & splendid. 2 fingers snap. It is tight, fly & off the chain. Thank you for the awesomeness, the contest, and generosity. :) Pick me, pick me! I think this phone sounds wonderful and has everything a person could want. OMG, I want this so bad. My contract ends in October, and at that time it WILL BE MINE! Really want to upgrade from my I9100 now. LG stands by what they promote themselves as i.e. Life's Good. I wanna better mine by participating in this giveaway. Thanks. Moreover, I have never owned high end smartphones. I have had mid-range ones, like my current Galaxy Ace 3 (which is starting to mess up badly, so I'm looking for a new one). I wonder, what are the battery life expectations from high end smartphones? Are they much higher than middle of the road phones? They have to drive much stronger hardware, afterall. Please clarify this point, thanks. In ~12 years of carrying high end smartphones, I'd say typical behavior for me is to have 20 - 30% of a full charge after a normal day, starting from 6AM until about 11PM. This has been fairly constant from device to device. My G4 does a bit better. It's usually at 45 - 50% with the same usage. It's difficult to make general statements about usage habits and battery life but my experience from one device to another is at odds with the article author's and I'd say it's an improvement on the Galaxy S4 I had been carrying. Please makeuseof this time because this phone is too dam awesome. I really love this new LG G4. How i wish i win this awesome giveaway. Anyway thanks again. Thanks for this wonderful chance ! I really haven't had a problem with battery life on my G4, but I disabled and barely use any of the stock apps, usually in favor of paid replacements (e.g. IM+ Pro for Hangouts). I wonder if there are one or two energy vampires among the apps the author is running, because I can probably get away with 36 hours without plugging my phone in. My biggest problem is the G4 is that my right thumb is a tiny bit too short to use the far left edge of the screen. As a secondary matter, there's no available root for the G4, so I'm currently stuck with bloat like Facebook and the Sprint Fun Zone or whatever it's called. Other than the LG Remote and the Flashlight built in to the Quick Settings, I'm going to ditch all the OEM and Carrier branded crap on the phone the first chance I get. Even with 230GB of available local storage that 40MB of LG Health offends me. Link for Intellinote not working.